This group exhibition considers the intimate connection between humans and the botanical. 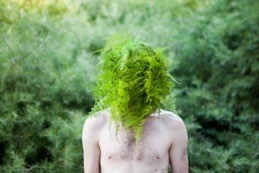 Each artist approaches their plant subject with intensity to consider the role of ecology in our contemporary lives. Fusing art and science, several of the artists decenter the human perspective to reveal plants as sentient beings, able to feel pain, to extend affection and fear danger. Other artists are concerned with our inter-dependency on plants for wellbeing or the long association of flora with the construct of the feminine. Some consider how nature is formalised through aesthetics or reveal how order in nature contributes to our understanding of existence. Image courtesy and © Pony Express, Exosex pinup boy #1, 2016.